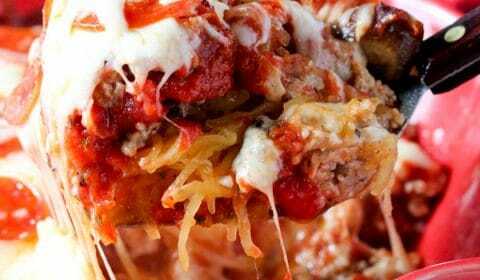 Spaghetti squash is my absolute favorite pasta alternative, especially in this spaghetti squash pizza bake. The kids won’t even realize you’re sneaking in a veggie, it’s that cheesy good. 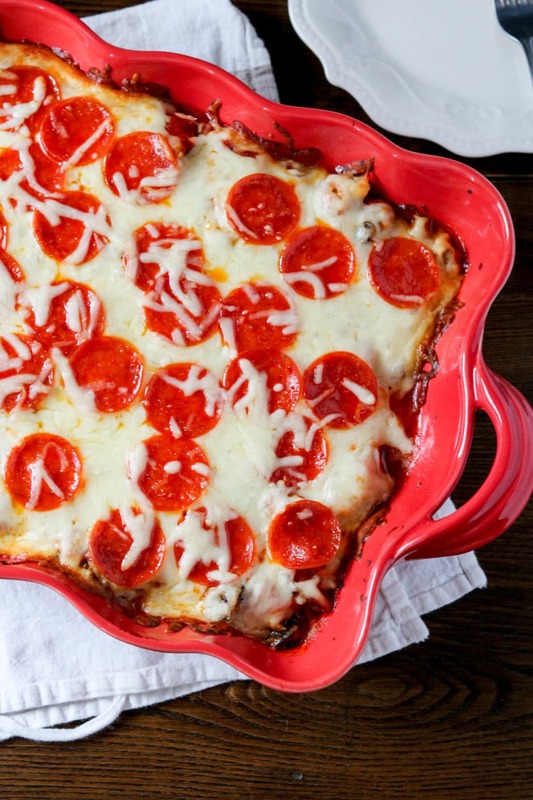 Obviously this pizza bake is not dairy free, but you could totally pull it off without the cheese if needed. I added in mushrooms and red peppers for extra veggies but feel free to add in even more! There are actually some pretty good gluten-free pastas out there, like brown rice pasta, and a lot of people will ask me why I use spaghetti squash instead of just a gluten-free pasta. Well, it’s because any chance to swap in a veggie I’m going to jump on it, because I struggle with eating enough veggies. Not to mention spaghetti squash is lower in carbs than gluten-free pasta (if you’re watching your macros) and it contains omega-3 and omega-6 essential fatty acids. 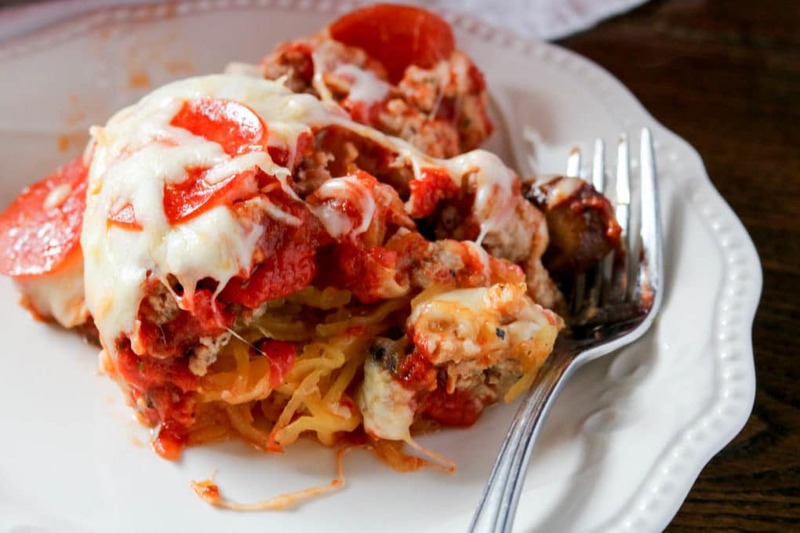 If you’re looking for a healthier pasta alternative, spaghetti squash wins hands down. Cut the spaghetti squash lengthwise and spoon out the seeds. Brush both insides with olive oil and season with salt and pepper. Place face down on a baking sheet and bake for 45 minutes or until it shreds easy with a fork. While the spaghetti squash is baking, cook the Italian chicken sausage, set aside. Once done, remove spaghetti squash from the oven and using a fork, scrape the squash out away from the flesh and into a large bowl. 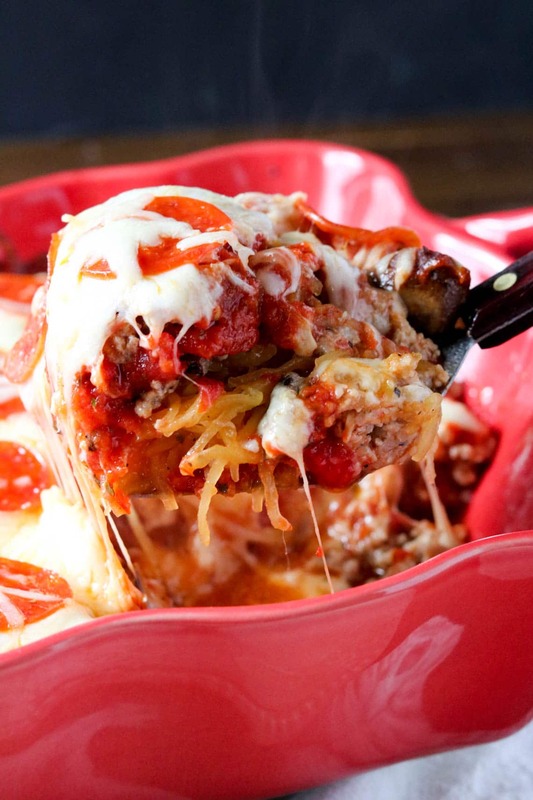 In a large 9×13 pan, add the shredded spaghetti squash to form the base layer. Then add the Italian chicken sausage, diced tomatoes, mushrooms, red pepper, pizza sauce and top with mozzarella cheese. Add pepperoni to the very top to finish it off. Return back to the oven for about 20-25 minutes, or until the cheese is melted and bubbly.